Elephant Arena is a new entertainment space in the heart of Elephant & Castle. Constructed out of recycled shipping containers, our quirky venue has a raw, industrial vibe and is truly a unique place to enjoy gaming in all its glory. In-pub Virtual Reality gaming has arrived at Elephant Arena. Come and try the ultimate in Next Generation VR Gaming and Entertainment. Battle your demons in a totally 21st Century way, completely immersed in a virtual world, while you wave your arms about to the amusement of all around you. Blow off some serious steam as you wreak havoc and defeat hordes of aliens or chill out exploring at your leisure. Up to four people can adventure in the same game either working as a team or competing to defeat each other. What could make this an even better idea? Putting it in the unique Lost Rivers Main arena, with a kitchen and bar, that's what. The VR Concept has just opened its unique brand of in-pub VR at Lost Rivers Elephant, bringing VR into London zone 1 for the first time. With 4 headsets built into shipping containers, the venue looks like something straight out of a cyberpunk future. Join up with as many as 4 people and go on an epic Quest together. With full voice chat and great character expressions, you are all really in it together. Take up bows or swords and try to defeat the Res-Room Dungeon. If someone dies, then a high-five will bring them back to life. 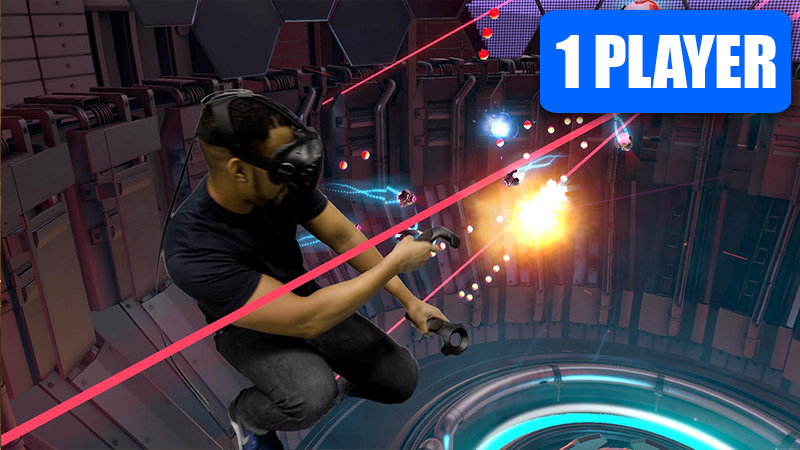 Once you've tried 4-player VR nothing will be the same again! Enjoy breath-taking views as you explore Vesper Peak. 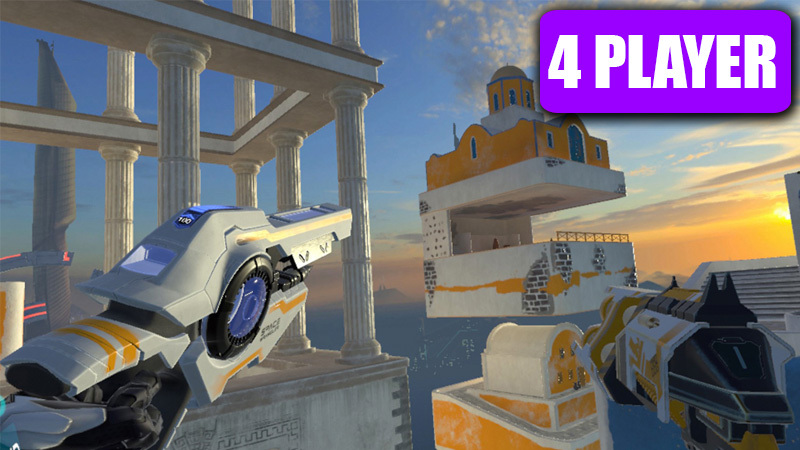 This may be a 1-player game, but you’ve got a little robotic dog friend to play fetch with! Relive the golden era of gaming -- only this time it’s all around you. Awesome retro fun blasting enemies from your flying drone ship. Tickets available for long turns (1 hour for 3-4 people) or if you just can't get enough of it, you can also book VR for your event. Please see the options below. *If there are no tickets available or if you just want a quick turn, then you can buy tickets at the door during normal opening hours subject to availability. Beer and games? Inseparable. Beer and VR deal now £10. Available 6pm - 11pm Tuesday - Saturday at our bar. Want to relive your childhood? Virtua Striker: The arcade-style football soccer sport game by Sega released in 1994, was was the first association football game to use 3D computer graphics. Extreme Hunting: Released in 2005, this game incorporates interactive guns to hunt animals through a series of levels. Arcade Classics - 2000 Games in 1: This is a dedicated multigame cabinet that combines arcade-standard reliability with a massive range of games from Pac-Man, Galaga, Frogger and Space Invaders. Star Wars Pinball - Data East: This fantastic pinball from the Data East company not only has plenty of features and toys on it's action packed playfield but is also based on the original Star Wars trilogy. May the force be with you! Dance Dance Revolution - Konami: is a music video game by Konami for the PlayStation. Released in 2001, the game contains a soundtrack of 27 songs and eight courses. Time Crisis 3: is the third installment of the Time Crisis arcade series. Two players can cooperate to advance throughout the game of action. Pair your favourite Lost Rivers brew with one of our bar games! Football table - Bonzini: The Bonzini Classic B60 is the grandfather of the Bonzini range, and is one of the first ever football tables produced on a large scale. Super Chexx Ice Hockey: Super Chexx® is a table hockey arcade game can be played by two opposing players who control all five hockey players and the goalie for their side, either 1 on 1 or 2 on 2.